Nepal Telecom (NTC) (Namaste) has launched gift packs for NTC mobile users. Using these packs NTC users can gift data packs and voice packs to their loved ones from NTC numbers to NTC numbers. In this packs they have included voice packs and data packs for Namaste SIM cards. This offer is launched in Valantine's Day and later other packs may also be included. Visit Nepal Telecom (NTC) gift portal link. You will see website as below. Enter your mobile number, check you balance first as balance will be deducted from your mobile number. Enter the receiver's number whom you want to gift data pack or voice pack. Choose data pack or voice pack that you want to gift. You will see total amount that will be deducted from your mobile number. 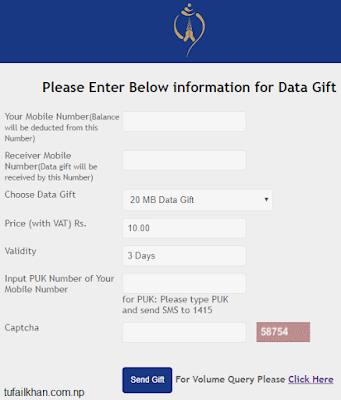 Enter PUK code of your mobile number. Enter captcha code from image. That's all now balance will be deducted from your number and gifted data pack or voice pack will be activated on receiver's number. Note: Never share your PUK code with anyone. How do I check gift balance and data which was sent to me in my phone?